Let me explain each of the requirements clearly. A dedicated IP in the requirement, because if you have the provision to allocate only 200 IP addresses to the machines on a network and you add a couple of Virtual Machines to the network you can’t expect it to share the IP address of the host network adapter. So if you can’t allocate a dedicated IP address the its better you opt for Network Address Translation (NAT) type of virtual network. Even though the virtual machines act as a separate entity it communicates with the rest of the physical network through the host machine’s network adapter so the network card of your physical machine hosting the virtual machines should have its network card connected to the rest of the network. Finally the DHCP part, don’t expect the virtual machine to allocate an IP address for itself because it can’t. Unlike NAT or Host-Only configurations which have a virtual DHCP server this doesn’t and you’ll either have to manually specify the IP addresses or setup a DHCP server on your network. The diagram displayed below shows how physical and virtual machines are connected in the network. The network layout shown is what I’ll be setting up in this tutorial. The IP addresses are assigned in the range 10.0.0.x so that it is easy to remember and type for newbies. The green box shown inside Host machine 1 is the network adapter, note that there are two lines the one on the left connects the virtual machines to the rest of the network via the host adapter using vmware bridge protocol. Do not get confused and think the machine has two network interfaces, it has only one. Select the virtual machine you want to configure, select “Edit virtual machine settings” if you already have a network adapter on this machine select the network connection as “Bridged” an option “Replicate physical network connection state” appears. If you select this option the IP address for this VM is automatically renewed whenever the network changes. Select this option if your setting up this VM on a mobile device connected to a Wi-Fi network which will be moved from network to network you can enable this else just leave it as it is. Assign a static IP address to each system on the network including the machine hosting the VMs. If you don’t want to manually enter the IP addresses you can setup a DHCP server. There is no need of setting up a full fledged computer as a DHCP server most routers and modems have DHCP built into them, so just connecting it with your network will do the job. Before powering on the virtual machine make sure the host network adapter has a valid IP address using which it can communicate in the network. 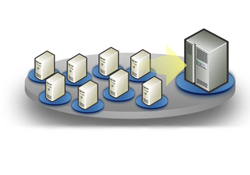 If the host computer itself is unable to communicate with the rest of the network then its no use to power on the VM and check for its connectivity. After ensuring the host adapter has a proper and valid IP address power on the Virtual Machine. After it boots into the Operating System check if the network adapter is connected, if not go to the VM menu -> Removable Devices -> Network Adapter click connect. Now if you have a DHCP server running on the network an IP will automatically be assigned else an Auto Private IP address will be assigned. You’ll have to open the network connetcion properties and assign a valid IP address for it. After the VMs have been assigned an IP address test whether they can communicate with other computers on the network by pinging them. Similarly from other physical machines try pinging the virtual machines. If everything works you have a full fledged network consisting of both virtual and real machines. But sometimes you may encounter a few problems along the way and common errors are explained here. The network bridge on device VMnet0 is temporarily down because the bridged network interface…. You might see this error on the bottom right corner when you try to connect the network adapter of the virtual machine. This occurs if no network cable is connected to the Ethernet port of the host machine. Even though the device is shown connected there is not actual connection and no communication will take place. If everything seems fine, there are no errors displayed but the VMs are not able to communicate then the following things should be checked. The network interface to which vmnet0 is bridged. If there are multiple network adapters on the host machine the virtual network might be bridged to the wrong network. To eliminate this problem disable the “VMware bridge protocol” option by going to the connection properties of the network interfaces which should not be used for bridging. IP address for the virtual machine is set incorrectly. There is a possibility of mistyping the IP address if you entered it manually, check if this is correct and also check the subnet mask address. Wrong option selected under network connection. 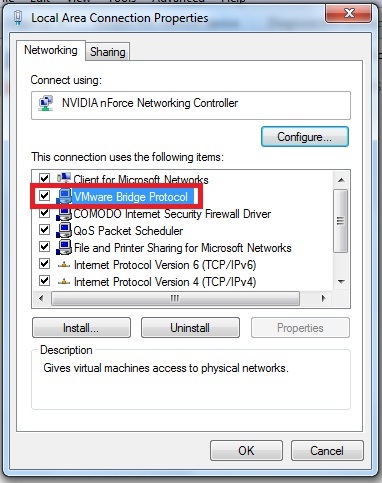 While setting up the virtual machine you might have selected a network connection option other than “Bridged” check for this and change it to bridged if this is so. Finally there might be a firewall running in the virtual machine which is blocking the network data transfer, check for this and create firewall rules appropriately. Thanks for the good tutorial.. I am trying to do the same setup you described above. But our corporate DHCP server is refusing to allocate an IP for my virtual guest which is windows 8. My host is windows XP. On the the wireshark network tracing I can see my virtual broadcasting IP request with correct MAC address. But no reply from any DHCP servers. Any idea why that could be. I can think of 2 reasons. Maybe DHCP server is trying to match up IP Request with MAC address and since my virtual mac address is not in the dhcp server it is refusing to reply. Since both my Host (xp) and Guest(Windows) are using the same NIC, and the IP request goes out on the same port, dhcp server think it can’t bind to the same port again to allocate an IP for my virtual since it has already allocated an IP properly for my Host(XP). I am not sure what else could be wrong. Have you got any other thoughts what else could be wrong? Appriciate you help on this. On which machine did you run Wireshark ? I suggest you run Wireshark on a different physical machine which is in the same broadcast domain as the machine running VMware. This way you can make sure DHCP broadcast packets are coming past the physical machine. I’ve had similar problems when using VMware bridged networking on Windows 7, Comodo Personal Firewall was blocking all packets from the VM. So try disabling Windows firewall and other firewalls if any on the Windows 8 machine. My VM running in bridged networking gets an IP address from a Netgear router connected to the physical machine so this setup is possible. I ran the Wireshark on my host machine (XP). Yes, like you mentioned, maybe the IP request may not be coming past the physical machine. I will try to monitor it outside the machine and see what I get. Thanks for the great advice. Yes it was the firewall not allowing the IP request to go out of the adapter. I confirmed this from the network trace outside the adapter. After I turned off the firewall, It is WORKING now. You’ve mentioned that no other physical machine is connected to your system which means the network card of your system will be “down” so “bridged” networking won’t work. Instead choose “Host-only” networking mode and find the IP address range of a network adapter named “VMNet1” in the “Network and sharing center” of your physical machine. Mostly the IP will be in the network 192.168.59.0/24 so assign these IP address ranges in your Virtual Machines and you’re good to go. You are most welcome. Surely I’ll write an article on those topics in the coming week. Hi Jesin Hope you are doing fine. I am newbie to all virtual machines and i wanted to ask about my situation. I want to test bandwith managerment system before i can put it live on my network as WISP provider but i am having problem with the configuration. I have windows XP host and i want to install the freeBDS software which is stand alone on the virtual machine normally it has to have 2 NICS one LAN and WAN. Meaning the WAN port will be used for the internet and LAN is for the local machines so the server can restrict and manage the bandwith of the local machines. My question is which networking should i use and best so i can see how this works before live deployment. In this case you need to use multiple networking types. The LAN port of the VM should be in Host-Only mode and as for the WAN port it depends on what internet connection you are using. If your Windows XP host connects to a modem using Ethernet cables and is assigned a private IP address you should use Bridged networking mode on the WAN interface of the VM. On the other hand if the host is directly assigned a public IP address use NAT networking. Hi Sir thanks for the email. I am connected to Netgear Router from a cable company which is online and does not need any user and password also my laptop is connected both using Ethernet and wireless. So should i try Host adapter on LAN and Bridged on the WAN? When your laptop is connected to your Netgear router using an Ethernet Cable use Host-Only on LAN and Bridged on WAN. But if you’re using the laptop’s wireless interface use NAT for WAN. i have a little complex environment. This sound strange for me but i understand why VM can’t communicate correctly. Different MAC address on the packet. Somebody is in the same problem ? vmnet0 is bridging adapter so it isn’t visible in the network adapters list. Is a telnet server package installed in RHEL4? and see if you get the necessary response. I am using VMWare Workstation 9 on my Windows 7 Laptop and created a new Virtual machine having Windows 2008 R2 Enterprise. My requirement: I want this VM to be connected to my home’s wireless network ( I opted for Bridged network adapter), but there are some softwares in my VM which require it to have a static ip. Can this be achieved in anyway? I will explain my environment. Please advise full IP configuration for the VM. Or can this be achieved using Bridged VMNet# virtual adapters connected to my Host PC? This can be done using bridged networking. Manually assign an IP address to the VM from the 192.168.1.0/24 subnet. The default gateway and DNS should stay the same unless you’re configuring Active Directory integrated DNS (in which case the DNS must be 127.0.0.1). However, when I am using Bridged networking and not manually assigning an IP address to my VM, it is taking the same IP as my host machine, therefore causing the IP conflict error to pop in my VM. How is your laptop connected with your modem? With an Ethernet cable or WiFi? When you manually assign an IP address to the VM are you able to ping the gateway (192.168.1.1)? My host machine is connected through Wifi. Yes when i manually assign an IP to the VM, I am able to ping the gateway. If you’re able to ping the gateway you should have internet access. Try pinging 8.8.8.8 it is the IP of Google Public DNS. When I am manually trying to assign an IP to my VM using the same ipv4 configuration, I am again getting an ip address conflict. Please advise. I am not able to ping anything now. It says PING Transmit Failed : General Failure. This is the “ipconfig /all” for my VM. Do you have any other VM running? In this VM change the IP setting to automatically assign and restart this VM. (uninstall and install vmware bridje protocol)..tryed this on diferent mashines, the same rezultat..
Hi Jesin, I am running a Windows Server 2008 with Windows firewall enabled and static public IP addresses. I have a Ubuntu Virtual Machine running (VMWare Player in bridged mode) on the same server with a static public IP configured in Ubuntu. I would like to have the VM behind the Windows Firewall so I can control the open ports easier. I have spent hours googling and reading VMware forums but can find anything. i am unable to ping external ip’s from my virtual dp software which was installed in esxi server in vmware work station. and i am using Lan connection and i figured out my ip is changing frequently. Hi Jesin, I have a question everything is working fine for me except i cannot remote desktop to the VM from the machine hosting the VM. If i choose NAt instead of Brdige then i can and the nat can even talk to the network but it can’t for some of it. How do i solve the issue with RDP. I try to ping the machine and i get nothing back. I have a noob question if you can help. I am just starting to use vmware to run linux. My question is if there is a way to have an internet connection on both my vm and host pc at the same time. My host is win7 desktop connected wifi to a belkin router. Yes you can, in the Network Adapter section of the VM’s settings choose NAT. objective- to connect 2 vmware machine networks on same laptop. 1. firstly I created a loopback network on each of VMware machines. 2.Then, I provided an static IP on both the vmware machines. Problem I faced-1.while pinging -Destination host unreachable on both machines. I have installed Windows 7 in base machine and then have installed VMware 11. I am planning to install Linux os in virtual machine but before that when i am trying to configure Virtual network I am not able to give bridge connection option. It allows me to give NAT and Host only. Recently I have installed windows 7 fres on my PC before than this it was working fine. Can you please tell me what’s the work around for this. Yes it is possible, set the network connection mode of the adapter to host-only. Thank you! I am actually using a switch now, I connected one more laptop to the switch for pinging purposes, I am using the bridged network which is the default vmnet0 connected directly to the host. The other laptop and see vmnet1 and vmnet8 but it can’t talk to the interface virbr0, it can also talk to the host… All the interfaces can talk except to virbr0 which is the main interface am using, I am troubleshooting it but I realized that I have no default gateway for my vm and also am trying to asign a static ip to vibr0 and a default gateway maybe that would help. Even on host only bridging it’s the same error, cannot access network, and from host ping says general failure. My firewall on my centOS is disabled. Any tips? I have my own companies network, domain, dhcp all configured and working great. On my virtual machine (just wanted to do own practical) I install virtual Server (ADDS,DNS, dhcp) and it should only broadcast IP address to virtual machines clients pc. I have already changed network adapter to HOST only on both the virtual machines settings. The client pc gets IP address from the dhcp server of VM ware. However the problem is, same domain name is coming out of virtual machine and conflicts with actual companies ADDS. Therefore everyone is getting my virtual machines IP address. Now I am wondering How dhcp is going out of virtual machine to the actual machines and bringing down our actual network. Please can you advise how can I disable dhcp from going out of virtual machines. Hello. Pls how can I link 2 Linux OS on separate systems using the VMware?? Hi , I have very simple question. I have a personal laptop. I have a normal broadband wifi connection at home through modem and router. I connect my laptop to this network only. I have created 2 Vms on my laptop . VMs have windows 2008 server 64 bit installed. I am trying to make these 2 VMs talk to each other , like ping one VM from another so that I can access have these 2 VMs(workstation) act as 2 host on same network. Can I do it sir? If yes can you please guidea me.